Occasionally touching but often disengaging. From beginning to end, Jerks plays out like one of the more romantic, plot-driven episodes of a popular modern sitcom. Think How I Met Your Mother, just set in Athens and with a splash of more sexually overt humour. Phivos (Giorgos Kafetzopolous) is our Ted Mosby, unlucky in love and trying desperately to make the most of his stagnant life. 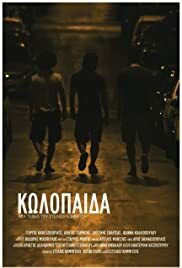 Along with friends Savvas (Diogenis Skaltsas) and Andreas (Aineias Tsamatis), the trio spend the night walking the city streets together before their flight for Berlin the next morning. But a lot can happen in one night, much of which puts their long-awaited plan in serious jeopardy. Virtually every facet of the film is competent and interesting on a basic level without being particularly memorable. The plot demands attention and the characters are well developed, albeit with a touch of predictability circling their motives. The humour is gentle but clever, while the realistic interplay between all three leads is a treat to watch. However, director Stelios Kammitsis' ambition gets the better of him in the film's final moments, where a bloodrush climax feels out of place in a film that, up until that point, was grounded in reality and drew much of its appeal from its pragmatic storytelling. The arguable highlight of Jerks rests in the film's visuals. Kammitsis employs subtle motifs and trick photography to convey polarising themes of contentment and loneliness respectively. His love of American cinema is prevalent, as classic footage, posters and T-shirts linger in the background of many scenes, encapsulating a mise en scene that gives off an almost autobiographical vibe. The film's pros do outweigh its cons, and it earns recommendation if only for its whimsical, lighthearted and unique presentation of a very real issue.